My Noodler's V-Mail GI Green was a bit too wet for my pen, and wound up getting into parts of the pen where I couldn't remove the ink. So I was looking for a more well-behaved green, and decided to give the Diamine Delamere a try as a sample from the Goulet Pen Company. This is a really beautiful green, true to the concept of green with maybe a touch more yellow in the shading. It's not the quickest drying ink, but it doesn't take forever like some. 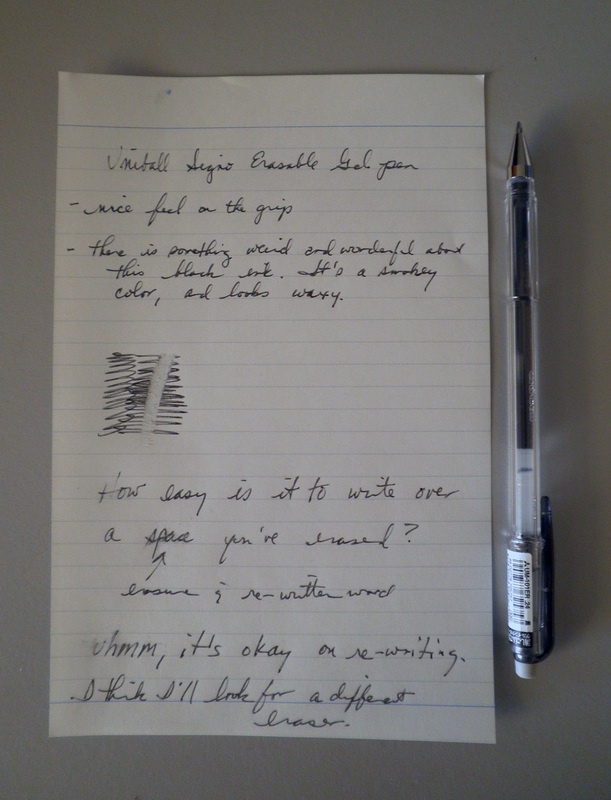 I tried it out on a Rhodia 80gsm notepad using my Pilot Custom 74 with a fine point. If you're looking for a deep green, try the Diamine Delamere. Richard Alford's post at Naked Capitalism has a really great take on why the "Powers That Be" are missing the point in their criticism of this YouTube video. It doesn't matter if the Fed can or can't print money (it can't, that's Treasury's prerogative), what is important is the humor used to get across the stupidity of the situation. The former and current enablers of this mess (Hank Paulson, anyone?) don't look like they know how to chuckle (unless it involves a horror story about foreclosure and how those people had it coming). CNET News recently showcased the tyPad, a keyboard case for the iPad that syncs via a wireless bluetooth connection. The iPad goes into a standard carrying case, and when turned on its side becomes a screen for the keypad. Sync the tyPad, turn it on, and the bluetooth symbol will show up in the top right next to the battery symbol letting you know that the keyboard is good to go. There are two blue lights, which fade out when the battery gets low and you need to re-charge the tyPad (comes wiht its own cable, and a travel charger is available at an extra charge. The keypad is fairly large, about the size of a netbook and it works exceptionally well. I've started doing quite a lot of work sitting in the cafe with a cappuccino on one side, a Rhodia Reverse Book and fountain pen on the other, and my iPad/tyPad duo typing away (the Rhodia is there for those times when I need to make some notes for later use). The tyPad works perfectly with the Docs To Go app (pictured above) for the iPad, and with Dropbox I can access documents I need to work on, make changes to them quickly using the keypad, and then save and go on to other things (like the cafe's mint mocha latte, for example). With all the Macs and Dells/HPs taking up a ton of space at the cafe, this has been a great alternative as the keypad is fairly stiff and will lay flat on most any surface. A few minuses that are really just my peeves: there's only one shift key, on the left, so I'll suddenly see some gibberish on the notepage due to hitting the right non-existent shift. And I'd like to have a better idea of the battery life, which seems to be about 90 minutes or more but I can't always tell. The blue lights turn off, but I don't know if that means low power or this is just screwing with my mind (no anthropomorphizing there, lol). The tyPad is now available at Tekserve as well, glad to see them at one of the major NYC Mac resellers and tekkie hangouts. Not cheap ($130 from tyPad), but the service has been excellent (had a few problems that Sean helped me with and he was gracious all the way while I fumbled with the jargon) and I'm very pleased with it's durability and capability. If you have an iPad, you might want to consider a wireless keyboard for it if, like me, you use it for work as well as Netflix. Just received a package from The Goulet Pen Company, with waves to Brian for such fast delivery. It's the new Noodler's Ink called Black Swan in Australian Roses. Had to swab it to see how it looks, quite an impressive black-red (the writing is a black flair pen). Can't wait to get home and ink up a fountain pen and give it a try. The paper is a Rhodia dotPad, and you get an idea of how the color shades and layers. First the turkey with stuffing, then a nap, then...shopping! Have a great holiday. If you've never heard of Ecosystem before, you'll be pleasantly surprised at their two-fold mission: to maintain a low carbon footprint in creating high-quality recycled journals, notebooks, and planners while fostering local manufacturing in the U.S. You can find out more about Ecosystem here at their website. Now, just a bit more of boring history. I bought the medium-size Artist Journal last year, and I was disappointed with the results. The paper, though bright and recycled, was very thin and had no coating whatsoever. (See this photo and this photo.) As I like to work in watercolor and fountain pen, the paper wasn't really suited to me. But it was smooth and bright enough for pencil, ballpoint pens, and gel pens. With this shiny new version of the Artist Journal, I was excited to see significant changes. The sketchbook I received was the large hardcover Onyx (7 3/8" wide by 9 7/8" high), constructed with the classic style popularized by Moleskine: leatherette materials, rounded corners, a ribbon bookmark, back pocket, and elastic band to keep the precious contents...uh, contained. On the front cover, running along the vertical foredge in lowercase letters, is the word "sketchbook" in varnish. This can pose a potential problem for those of us who like to work en plein air and incognito, as this one word can effectively reveal our true purpose to our targets, I mean, subjects. Hiding it is a simple solution, but I prefer not to announce to the world what kind of book I have or expend the energy to hide the cover of a large book, especially since it's hard enough to remain incognito and ninja-like while sketching random strangers. The book lies flat thanks to sewn binding and good construction that is characteristic of Ecosystem Journals (I regularly buy their small Author notebooks to use as a daily to-do, and let me tell you, those puppies are sturdy). The paper is 80lb text weight, "acid-free super-bright." There are no perforations on the pages, which is wonderful for folks who like to work across the gutter and work on a spread of a book. Using Mitsubishi Hi-Uni pencils in the B range (B, 3B, 10B) was delightful on this buttery-smooth paper, which was able to take layers of cross-hatching and blending as well as repeated erasing using both a kneaded eraser and a plastic eraser. There was hardly a noticeable disintegration in the erasures, but when I draw I don't press hard unless necessary, preferring to build darks in layers instead. Next I used a fountain pen, a Sailor Regulus with a fine nib and filled with Platinum Carbon ink (my favorite waterproof ink). Again, the paper was smooth and a joy to work with. The lightest touch was the only requirement to render a faithful line. 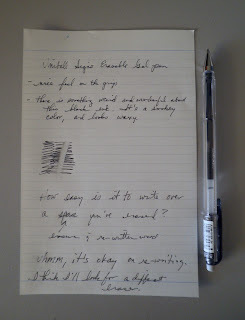 There was no feathering or bleed-through from the fine-nibbed fountain pen, or the double-broad stub Nakaya loaded with Sailor's Limited Edition Doyou ink (for those of you who like to use blank sketchbooks as their primary writing notebook). The same goes for the Pentel Pocket Brushpen, one of my favorite tools for sketching on-the-go. Faber-Castell Pitt Artist pens simply pop on the bright white paper with just the barest hint of see-through on the reverse side of the page. Copic markers, as expected, bled through the page but did blend nicely. (Not a lot of papers take Copics well, so this wasn't a surprise.) I don't use markers often, and when I do it's usually in a painterly manner. I love working with watercolors. This is a requirement that usually ends up making or breaking my decision to keep a sketchbook. Some are hits, a few are misses, but a large portion of the sketchbooks I've tried have fallen somewhere in-between. The Ecosystem Artist Journal falls in this last category. While the Ecosystem Artist Journal definitely takes watercolor a lot better than the first version, it doesn't hold up well to heavy or repeated layers of washes and eventually seeps through the page. The wax-like coating on the paper beads the water in a similar way to the Moleskine sketchbook and buckles the paper. The Ecosystem Artist Journal is a wonderful value for a sketchbook: at $19.95, the book is well-constructed, its smooth paper takes a good variety of commonly-available materials, and the "super-bright" whiteness of the paper will make your colors sing. I wouldn't recommend using charcoal or pastel on this paper -- it's simply too smooth and these dry media prefer a toothier material to hold on to. For light washes of watercolor, they're okay, but not something I'd recommend for a serious enthusiast. 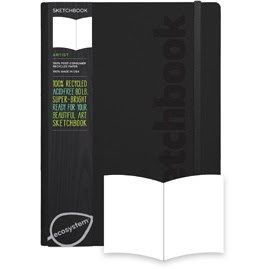 This is a great sketchbook with many fine qualities that make it worth the price to me. And while it doesn't take watercolors as I'd like, it's not something I have to work hard to work around. With any sketchbooks there are limitations to its performance, but that's just the way it goes. I applaud Ecosystem's commitment to the environment and support for local American manufacturers, and the company's responsiveness to customer feedback. I'm happy to see the Artist Journal revised and upgraded into a true contender in the art materials arena. 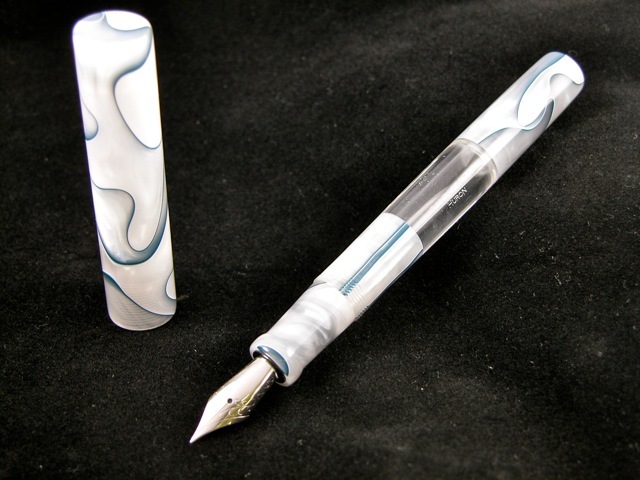 Brian of Edison Pen Co. emailed to let me know my Huron bulb filler, in Silver Marble, is finished and ready to ship. 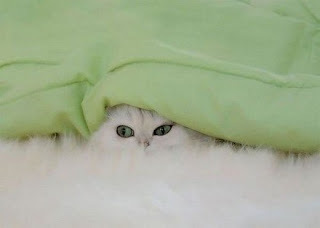 He also sent these pictures, which make me want to reach through the laptop screen and grab it right now! This video of UCF professor Richard Quinn dressing down his class is really powerful (approximately 200 out of 600 cheated on their mid-term and got caught via statistical analysis and a guilty conscience). He's obviously very upset, watch to the end and you'll see him breaking down a bit. More information here. The 2010 Chocolate Show at the Metropolitan Pavilion had a lot of new faces (at least for me), including Sendall Chocolates and their incredible box of Toffee Taboo. 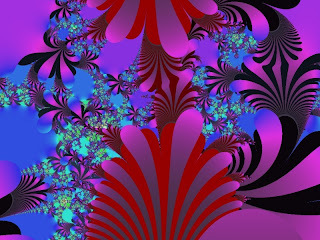 The company is located in Pittsburgh, PA and has a wonderful selection of treats and goodies. Here are Justin (l.) and the founder of Sendall Chocolates Robert Sendall (r.) in front of their wares at the 2010 NYC Chocolate Show. While I loved the chocolate, I will note that the shipping charges are fairly high (most likely because they are mailing food items and particularly chocolate, so they have to make sure it gets to you quickly--which costs extra). So if you're thinking of ordering, you should consider a large order of Toffee Taboo or one of their seasonal items. It's not the weight of the chocolate but the need to ensure prompt delivery that raises the cost, but it is beyond worth it. I've always thought the point of writing in ink was permanence--you can't erase whatever witty (or less than so) sentence is on the paper claiming to be your handwriting. But there are times when you do want to correct a mistake or re-write a thought that's on paper, so erasable ink pens such as the Uni-ball Signo Erasable Gel were created. Using an erasable gel ink pen is a conscious act, one that pretty much says that you know you're going to erase something. You can't hide from that statement about yourself, so why not wear it proudly and with some style? If that's more to your taste, the Uni-ball Signo Erasable Gel's "little black pen" will be perfect for you. This is an 0.8mm tip and I f0und it to be the right width, but JetPens has them in 0.5mm and in an assortment of colors for a very low price of $1.50. The black ink on this pen is quite different, it has an almost oily sheen to it that makes it more of a smokey black than a true black. That is probably from whatever is used to make the ink erasable, and may not be to some people's liking. I thought it was unusual and appealing. The eraser is on the end of the cap, so once you post it on the pen you're all set. 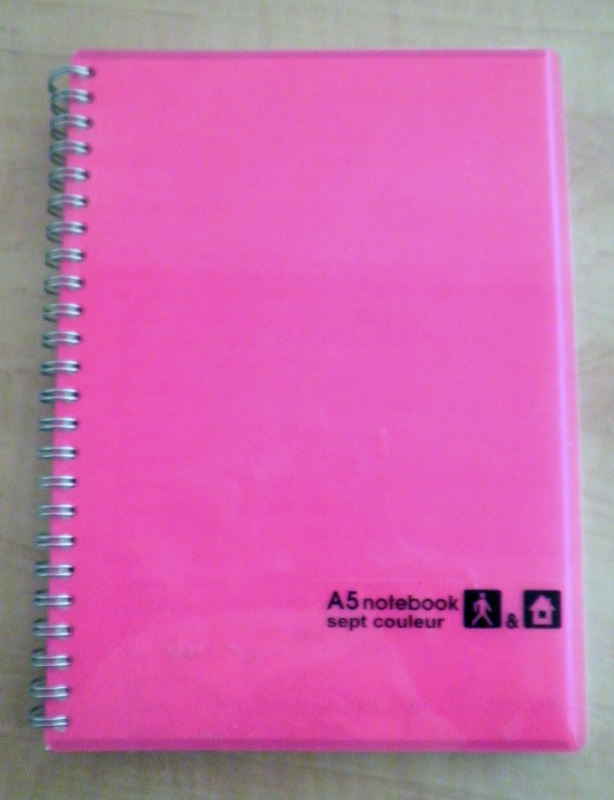 It does its job quite well, although it does leave a lot of rubber crumblies on the page. You might want to invest in a different, stand alone eraser if that's of importance to you. One final test was how well the pen overwrote the erased space. Here is the deal-breaker on erasables, as some are not very good at that particular task. And the Uni-ball Signo Erasable Gel did quite well at this particular job. Not perfect, mind you, as there was a bit of skipping and invisible marks where writing should have been, but quite well. If you're interested in erasable gel ink pens, or you need to round out a JetPens free shipping order, take a look at the Uni-ball Signo Erasable Gel ink pen. Maruman's Sept Couleur notebook line features the seven colors of the rainbow in a two-ring notebook that comes in two sizes, A4 (letter) and the smaller A5. Although I tend not to like ringed notebooks or vinyl plastic transparent covers, I've made an exception with these for several reasons. The biggest problem I have with transparent covers, even if there is lots of writing or pretty pictures, is that everyone can see what's written on the first sheet. So there's an automatic skip to the next page for me. As you can see in the picture above, the Sept Couleur notebook's first sheet is a slightly heavier blank page that acts as a barrier between your notes and the world's eyes. I like that a lot, and so have taken to carrying this with me for quick jots and doodles. The 7mm line width does make a big difference to me in writing, I don't need to pull my writing into a smaller, cramped style but can let my hand move as it wants. 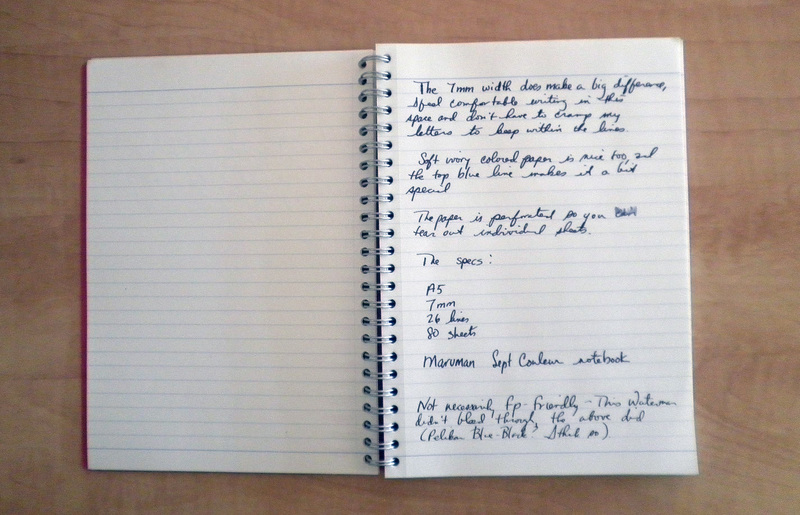 The page has 26 lines and there are 80 sheets of cream-ivory paper that is Rhodia-like but not quite up to it. The paper is so-so with fountain pens, friendly to some ink (Waterman did not breach the pulp) and unfriendly to others (Pelikan 4001 bled like a badly beaten boxer *snicker at alliteration). 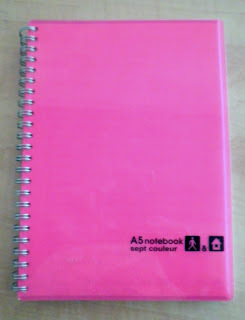 JetPens carries this line of notebooks, both the A4 and A5 sizes, although they are slightly higher than at Kinokuniya. If you're in NYC, stop by the store on 6th Avenue between 40th and 41st, across from Bryant Park, and take a look at all the fantastic notebooks they carry as well as these Mauman Sept Couleur. The neo-Celtic group Bardou with James Kline and Kornel Mariusz Radwanski. An intricate performance of Greensleeves with Radwanski playing a centuries-old Swedish instrument called the nyckelharpa and Kline playing a harp guitar with 19 strings. No, this isn't the pen I'm waiting for from Edison Pen Co. but oh, would that it were. What an amazing-looking pen, the hieroglyphics are beautifully engraved. As for my pen, according to the email from Brian my ivy-green-and-white Huron Bulb Filler went on the lathe yesterday, will be engraved on the 19th, and shipped on the 22nd. With all the pens I now have you'd think waiting on this one would be easy? Not. I was looking at several inks at the NYC Pen Show and saw the Pelikan 4001, which I later purchased in Blue-Black to try out with my Monteverde Invincia Color Fusion. The two did not get along, but I wanted to see how the 4001 ink ($9.75) worked in another pen and decided to try it in a Pelikan, the M205 Clear Yellow highlighter that I bought with an extra fine nib. Then I decided to see if next to the Pelikan Edelstein in Topaz ($20), and decided to use my Pelikan M205 Clear Blue with a fine nib, just for the symmetry. Both inks have their attractions, the 4001 is a dark blue with black shading in it. I like the color, it's a good, everyday ink. The Edelstein Topaz is bright blue, and also shades very nicely. I'm thinking J. Herbin Bleu Pervanche might be very similar to this ink, at least on the monitor. Both inks are a nice edition to my line up. I'll be very interested to see if any other pens aren't fond of the 4001, or if it's a Monteverde quirk. The 2010 Chocolate Show in New York City was November 11 to 14 at the Metropolitan Pavilion on W. 18th Street. Not one of the bigger shows to come to NYC, the Salon du Chocolat is certainly one of the most...luscious. And expensive as well, with a $30 per day price tag just to walk in the door. But worth it if you know what you want beforehand. This particular booth sold the most fabulous salted caramel chocolate bars ever made (at least in my opinion), and at $9 a bar for 3.5 ounces it was actually a bargain. One of the more exclusive chocolatiers is Mary of Japan, which makes incredibly beautiful chocolates and sells only at their 100 or so stores in Japan. We were all looking for their ganache, which comes in interesting flavors (green tea my favorite, wasabi was interesting). A crowd of us had formed asking for the ganache, only to be told by the polite Japanese woman at the counter that they had not brought any this year. Mouths dropped, and many people actually walked away from the booth. I decided to assuage my disappointment with several small gift boxes for friends (and one for me). As you walked into the main hall, to the left were mannequins wearing mod clothing and chocolate accessories. To the right was a very large train set made in different shades of chocolate. The sign wouldn't do anything against a determined, hungry horde of chocoholics, but fortunately the train was at the front entrance so security would immediately available to save the engine and maybe a wheel or two. One of the events they put on every year is a fashion show using cloth and chocolate. The bustier is made out of chocolate, I think the skirt is spun sugar. This model's long coat is made of chocolate discs of white, dark, and milk chocolate. And this model has a waist-cinching belt made of chocolate pieces. One of the galleries to the left of the entrance, filled with booths catering to chocoholics. More to follow later in the week, including a review of Peanut Butter & Co.'s 6-pack assortment (Chili Peanut Butter sounds interesting), and a description of the milk chocolate gift box of Toffee Taboo from Sendall Chocolates. This is the occasional rant I mention up above in my title. Walking to Costco this morning I noticed a Channel 4 NBC news truck parked at the entrance with a cameraman and reporter talking in front. The reporter asked if I would answer a few questions on camera about our senior senator Chuck Schumer's latest pressing issue, and I agreed. My mouth dropped when he told me what Chuck Schumer is up in arms about now (I'm sure that will be edited out if this ever makes it on TV): the tyvek-style bag on my shoulder that millions of us buy each year and use in order to "be green" contains lead, and Senator Schumer wants to pass legislation banning these bags. I babbled a few things (including the one about "I don't mean to sound like a bigot, but these are made in China, the land of no regulation, and imported into the US, the land that demands cheap prices). I also mentioned that with unemployment high, houses falling into foreclosure, and financial institutions running amok this is not an important issue. Senator Schumer might want to concentrate on regulating his good friends on Wall Street (and our Chuck has many good friends on Wall Street). 1) No, I'm not worried about lead in my reusable bag. I'm an adult, and we have a tendency not to panic over minor issues. 2) Chuck, if I may call you that, I do understand why this is a big issue for you right now--if you're not going to govern, then you need smoke and mirrors and fear, lots of fear. Since we don't have orange and red terrorism alerts anymore, this will have to do. 3) These bags have been coming into the country for decades now, tens of millions at a time. Why is this moment (post election November 2010) the time to start regulating their import? Are you thinking that we import too much from China already, so any reduction will help? And if I cry into the ocean, will it raise the water level? 4) Is this ploy a part of the Senate Full Employment Act, keeping idiots at work on something insignificant before they actually do damage to the country? Nice try but too little, too late. Folks, every year my building management sends me a letter letting me know that they tested the public areas of the building and there is lead paint all over the place. Likely my apartment is full of it as well. There is no reason to become afraid or panicky over this, as there are options. Maybe you don't like them, but that's not the point. I live in a place where over 8 million people crowd into what is a very tiny area, with some 2 million of us on an island that doesn't have a lot of exits if there is ever a reason to get out of town fast. I don't panic over getting TB or the 'flu from someone on the subway, or how I'll ever get out of Manhattan in case of a tsunami. Our city is broke and borrowing like mad, our state is broke and cutting services like mad, and our country is broke and too afraid to admit what is happening so everyone is mad. I'm angry and scared and annoyed, and you want me to be frightened about lead in my grocery bag? Guys, I gained 20 pounds when I quit smoking two years ago, but even with the extra weight I'm still not that big an a##hole. When OfficeSupplyGeek reviewed the Monteverde Invincia Black Stealth fountain pen I couldn't keep from wanting one, especially as it looked so awesome with its black titanium nib. But I really didn't want to order one unless I could try it out first, and as I didn't see any in the NYC shops I let it go. Then Monteverde introduced the Invincia Color Fusion, and among the new colorful Invincia pens are Avenger Yellow and Spitfire Red. These I really wanted to see, but couldn't find any locally. Bu I got my wish at the NYC Pen Show, passing by the table where the courtly gentleman from Total Fine Writing was unpacking a few pens and doing a very swift U-turn to take a look at the large shiny yellow pen he'd just put on the table. As the picture above show, the Total Fine Writing table had a lot of amazing pens on view, especially the Viscontis in the upper left. The Monteverde Invincia Color Fusion in Avenger Yellow is my kind of "double-take" pen. It's big, and while the nib isn't really larger than some others that I own it seems to be whale-sized, possibly because it's black rather than silver or gold. That makes it seem like an extension of the section, rather than a separate part, so it gives the writing tip a longer, larger feel. My pictures don't really bring out the yellow color of this pen, they are a touch too orange. The Avenger Yellow does have a slight orange shade to it, and the barrel has a graceful curve that adds some interesting design style. The black accents (clip, section, band, ends) are a nice touch, making this a nicely done, color-coordinated fountain pen. As for writing, the nib has a touch of flex to it that I hadn't expected at all. But the dealer only had a medium nib, which I'm not fond of in non-Japanese pens, so I thought to have Pendleton Brown work his magic and make this into a cursive italic. And the result is a very lovely writing style, something I like and would recommend it you're thinking of adding a little magic to your pen. A few minuses: the plastic piece inside the cap that keeps the nib in place came loose, and often comes out attached to the pen. I've tried gluing it back, which doesn't work. It's a minor annoyance, and now the pieces seem to be behaving. But at some point I'll have to deal with this in a firmer manner (I gave up after I got glue on a few places on the barrel and didn't notice until it had dried and wouldn't come off--now the pen really does reflect my personality, lol). Another detail I hadn't noticed is that this pen really does let me know if it doesn't like a particular ink. Pelikan 4001 is out, while Waterman seems to be high on its drink list. I'm looking forward to trying Noodlers and Iroshizuku, and possibly the new Everflo inks. The next pen I'm thinking of trying in the Monteverde Invincia line is the rollerball that fills like a fountain pen. I've seen a few of these around, not the Monteverde but a different brand that touts the filler system, and am really curious to see how well they work. Spitfire Red would be my first choice of color, that would look amazing on its own or in my pen case next to the Avenger Yellow! After seeing the Ecosystem booth at the National Stationery Show back in May I was really interested in their journals, and kept reminding myself to get over to Barnes and Noble to check them out again. But as I tend to buy online at B&N for the MyPoints credit, Ecosystem took a back seat to other things. A few weeks ago I did get to the bricks and mortar store, and checked out all the Ecosystem journals available. What I wanted was a large Grape line journal, or a medium Clementine hard cover blank journal, neither of which seem to exist. So I decided to go with boring-but-dependable, and chose an Onyx medium hard cover blank journal. What's interesting about the Ecosystem medium journal is that in terms of size it is right between the Moleskine blank journal and Rhodia's Webbie (as shown literally in the above pic: l-r, Moleskine, Ecosystem, Rhodia). The Ecosystem cover is not as glossy as the Moleskine or as leather-like as the Webbie, and it will pick up dings and dirt from being carried around in various bags. In terms of paper, Ecosystem's 100% post-consumer recycled paper is amazingly bright. 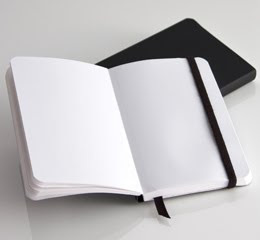 Granted I don't really have many blank journals with white paper, but the above gives a good idea of just how the Moleskine and Rhodia stack up against white: Rhodia is definitely a darker ivory, while the Moleskine has a lighter ivory shade. So if you're looking for bright white paper, it's Ecosystem FTW (for the win). Like the others, the Ecosystem Journal has an elastic band to keep it closed and a back pocket for papers and other stuff. There's also a registration number, if you want to fill out the form in order to log in you journal should it go missing and some kind soul wants to get it back to you (or blackmail the dickens out of you, should you be so inclined as to write down everything). But unless your journal is reall y a status symbol (here's looking at you, Hermes), it's main purpose is to be written in and not shown around. Ecosystem's paper makes for a really interactive writing experience, one that I hadn't thought about until I used this journal. I definitely liked using the Ecosystem blank journal, and it does a fairly good job of laying flat on a surface which I appreciated. There are some quirks that make it, for me, a more engaging experience--a word I hadn't thought to use for a paper journal, but which seems quite apt now that I think about it. 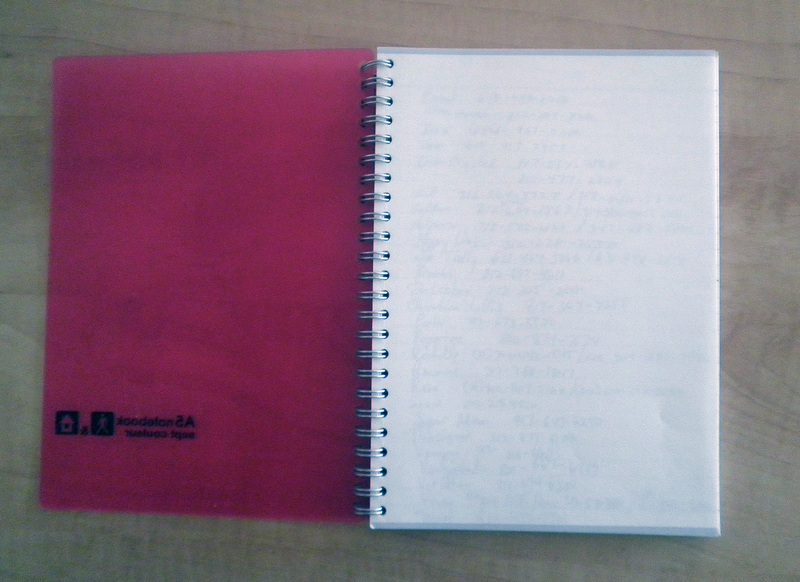 The bright white paper is fairly thick, but not in the Rhodia/Clairefontaine league. One very nice touch is that the paper is perforated, so if you want to remove a sheet you don't have a jagged, ripped edge to deal with later, which I do like. This recycled paper is quite thirsty, and it has a tendency to absorb a lot of ink and then bleed through on the other side. However, with some fountain pens and certain inks the paper was extremely well-behaved while some rollerball gel inks bled straight through and onto the following sheet. 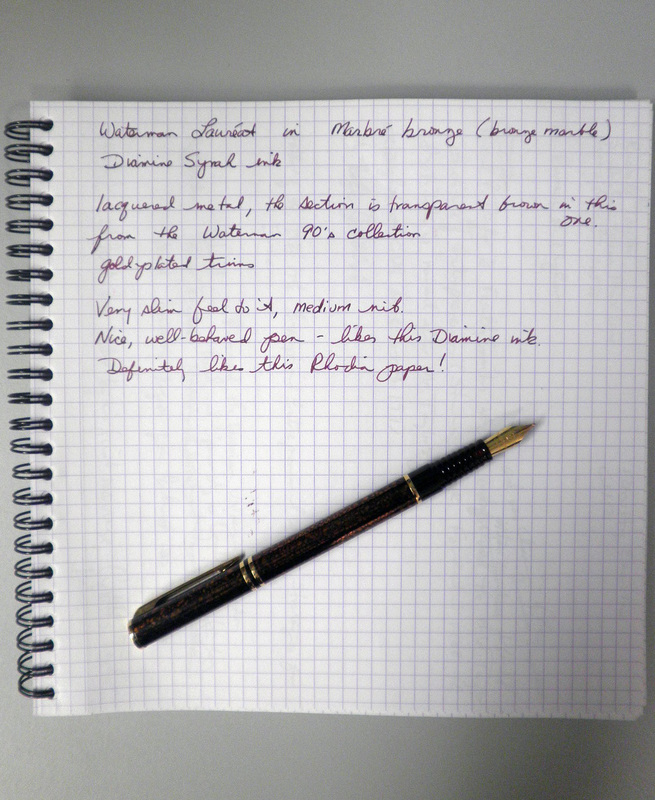 For the most part, my Onyx likes an extra fine or fine point fountain pen and a drier ink such as the Pelikan 4001. Medium and up nibs are use at your own risk, depending upon the manufacturer. In these two pictures, the first pen was a Pelikan M205 Yellow Demonstrator with an extra fine nib using Pelikan 4001 ink, and there was no excessive ink absorption or bleed through on the other side. The Pilot Namiki 823 medium nib with Sheaffer ink also worked very well, but my Waterman Laureat with Diamine Syrah had a lot of ink absorption and bled through the paper. The Pilot Namiki Custom 74 with a fine point nib using Noodler's V-Mail GI Green had a lot of bleed through, the writing was extremely difficult as the paper was absorbing too much ink, and there were small blotches of ink on the following page. Gel ink pens were not without problems either. My Parker Vacumatic Retrofit using a Monteverde gel ink refill definitely had a lot of bleedthrough, but the Pilot Hi-Tecs I used didn't even dent the white paper much less drink up lots of the ink. So some gel inks are very usable on this paper, some are not. What I've learned is that the Ecosystem Journal is somewhat temperamental, and really does respond to the type of pen and ink that's used on the paper. That to me is more intriguing than frustrating, as it demands that I think about what I'm writing with when I pick up this journal. And I've started keeping a written diary of the different pen and ink experiences, which is also something I hadn't thought to do before. Now, about the choices. 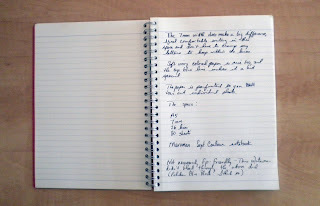 Guys, can't you make a medium hard cover journal in Clementine? And a large hard cover in any color would be excellent (any type of paper would be fine, but blank and lined are my first choices). As for buying it, for some reason Barnes and Noble at Union Square North near 14th Street in Manhattan decided to either get rid of Ecosystem or just hide their journals as they were nowhere to be found a few weeks ago when I went back for another look. So I may have to go online if I want to get another one, which isn't as fun as picking it up and using it right away. The Carnival of Pen, Pencil and Paper is here, hosted by The Pen Addict. Take a look at the great posts on the new inks, pencils, and more. I like to be prepared for all occasions, meaning lots of different fountain pens and inks. Left side: (l-r) Parker Duovac, Sheaffer Slender Balance, Moore celluloid, Parke Vacumatic Retrofit rollerball, Pilot 823 Smoke Demonstrator. Right side: (l-r) Monteverde Invincia Color Fusion in Avenger Yellow, Waterman Laureat Red Marble, Parker Latitude, Pilot Namiki Custom 74, Waterman Laureat Bronze Marble. André Mora of Mora Stylos was at the recent NYC Pen Show, and had a very nice selection of NOS Waterman fountain pens. I really liked these Lauréat pens, and purchased several, including a Marbré Bronze. The medium nib on this pen seems to change back and forth on line width depending upon the ink I used. My first go round was with a Sailor blue-black ink cartridge to try it out, and I had a slightly-finer medium width that I liked. 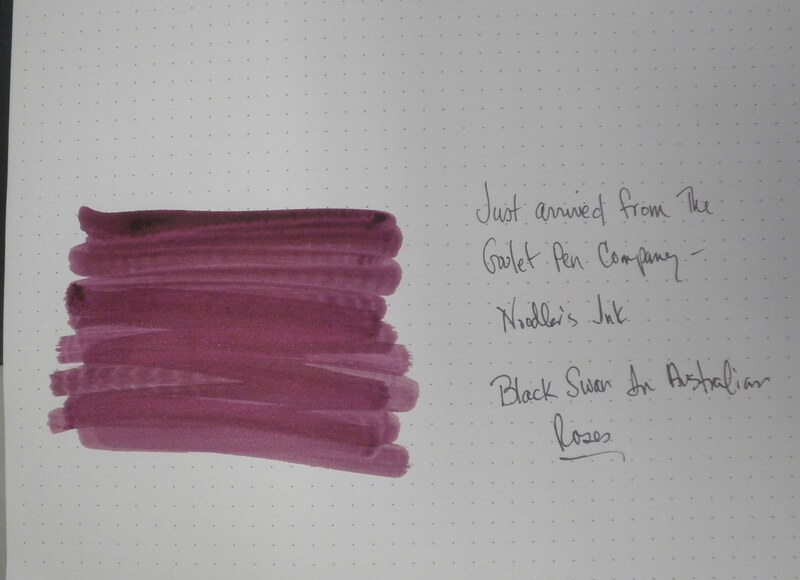 But now I've got Diamine Syrah in the pen and the wetness and line width are a bit more than I wanted. I'm being very careful with this pen as I've had bad experiences with lacquer over metal finishes. My lovely bright red lacquer Cross ballpoint scratched terribly to the point where I put it away in a closet somewhere and try not to think about it. So I'm keeping this one in a cloth case, and trying not to bump or jostle it too much. Lately I've noticed how my pens react to various inks, and have started making notes on which works with what ink. One new pen DOES. NOT. LIKE. the Pelikan 4001 blue-black ink I used, and made it very clear to me by skipping and scratching and refusing to write. Took out the Pelikan blue-black, put in Waterman black, and the pen is in heaven and writing perfectly. I'm wondering if it will have the same reaction to an Edelstein ink, which are from Pelikan, and am looking forward to the test. DarkSideDuc is showing off a new paint job, with one of the best portraits of Jack I've ever seen. Oh, and the bike looks good too. Drop by his place and take a peek. I was writing with one of my Lamy pencils and realized I didn't have a sharpener big enough for it, so off to JetPens to look for a Kum sharpener. 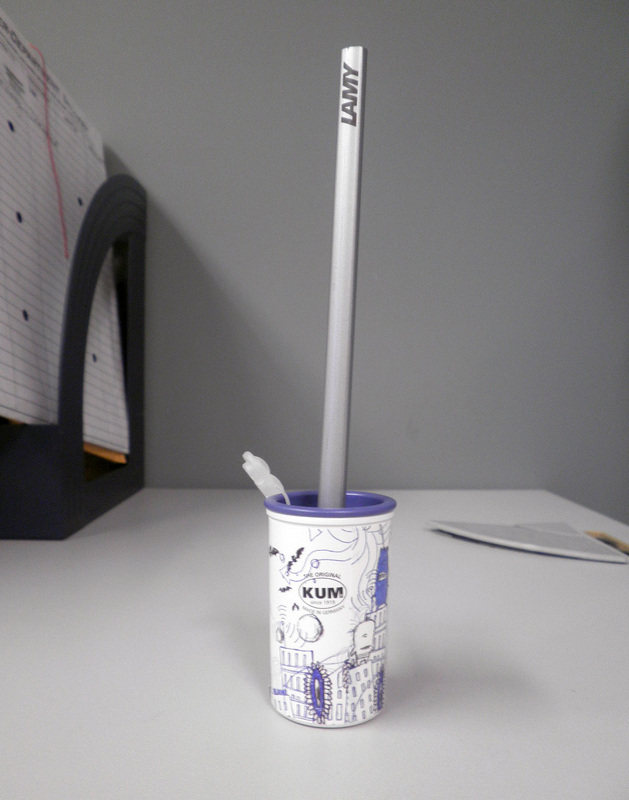 The one I really liked was the Kum Scribble 1870K M2 Magnesium Pencil Sharpener. What's interesting about this sharpener is that the two options aren't for large or regular-sized pencils but to produce a long and sharp point for harder lead grades and another that makes a shorter point for softer lead grades. Up until I saw this, I hadn't given much thought to the different pencil-sharpened lenghts--the longer, sharper point (which seems like a regular pencil point) versus the shorter point (the kind I associate with golf score cards and the Ikea store notepads). 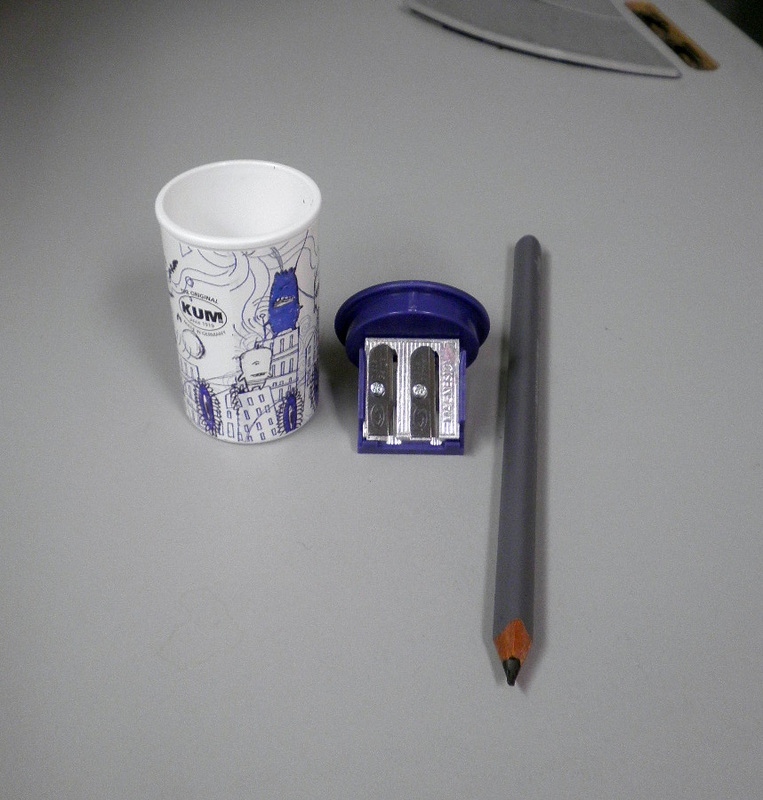 The Scribble is a fun sharpener for another reason and that's the scribbles on the side. The City sharpener shows tall buildings being climbed by monsters, and bats flying all over the place. Which makes me curious about the other Scribble sharpener featuring a Garden motif--the bunnies don't seem to have fangs, but I can only see one side on the JetPens website. Passing through Sustainable NYC on Avenue A & 9th Street a few weeks back I saw this pen at the check out and had to get one. The shop had contracted with Lecce Pen to make their own green, biodegradable ballpoint, and designed the pen so that the colors are reminiscent of an ear of corn growing on a corn stalk. The pen is made from Mater-Bi, a biodegradable corn starch product that can be processed using the same transformative techniques as plastic. Which helps market this product, the manufacturing is similar to plastic and doesn't require new equipment--which doesn't increase the price prohibitively either. It's actually a very good ballpoint, it writes quite well with no skips or blobs of ink in the paper and as the barrel is square it feels different in the hand. What I also was interested in was taking it apart. If you're thinking of re-using the pen, the refill is quite long and on the slender side. But I'm thinking a Hi-Tec-C ink refill might also fit, and am planning a hack as soon as I find my pens. If you're ever in the area check out the Sustainable NYC shop. It's 1300 square feet of recycled and fair trade goods, and every possible inch of space is packed with amazing items. Great review of Bic's Easy Glide ballpoint and a few to giveaway over at The Pen Addict. And don't forget to stop by his place next Tuesday, when he hosts the 15th Carnival of Pen, Pencil and Paper. Three or four months leading up to the NYC 2010 Pen Show I'd found online what looked to be my dream pen, the Parker Duofold Vacumatic. 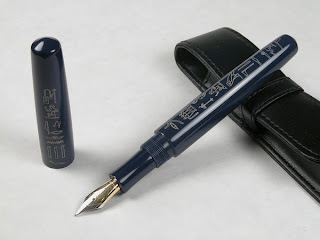 At first I only knew from the eBay descriptions that it was a Duofold, then looking around Fountain Pen Network and the Parker Forum I found out that my ideal-pen-in-stripes is a Duofold Vacumatic. 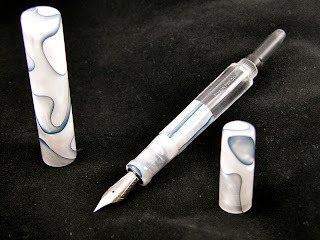 The only problem I had was that I could't actually determine the quality of the pen from the eBay postings, and as the Pen Show was coming up I thought I could find a Duovac I liked (and could actually touch) from a dealer there. My wish did come true around 3 pm when I saw this pen at one of the tables where the dealer wa packing up his cases to leave (he wasn't at the show on Saturday, so I'm glad I didn't wait). I asked him about it and he was very happy to show me the pen. He told me it was in perfect condition, except that it didn't work. When I started to laugh he went on to say that the sac was busted so the button filler wouldn't work, but the pen barrel had no scratches, the nib was in perfecct condition, the celluloid had great transparency, and the engraving on the side was crisp and clear. All of which turned out to be true, including that the pen didn't work. One of the best memories I'll have of this Pen Show was the look on Ron Zorn's face when I handed over the pen and told him exactly what the dealer told me--it's in pefect condition except that it won't work. Ron took the pen apart, cleaned everything, attached a new sac, sprayed, waxed, and polished the Duovac. Was it a fine or medium nib, I asked him. Yes something like that, was his answer. Is the nib 14ct, I wondered? It certainly could be, he replied. Laughter all around, it's hard to say on a pen that has no particular markings on it. What I do know is that when he handed it over to me I was in heaven. This pale blue and red striped Duovac measures 5 1/8" capped, 5 3/4" posted, and from the end to the tip is almost 4 3/4". Which would make this a Debutante model, a smaller pen to fit into a lady's purse. It's about the same size as my Pilot Namiki Impressions, which is another of my dream pens. The side engraving says "Parker Duofold Made in U.S.A." with a 2 and a dot in subscript--made in 1942, first quarter (I think). I had never tried out a button filler before, and it was a bit strange (along with several people waiting for Ron who gave me pointers on what to do, which tends to make me nervous and clumsy). Eventually the pen was filled with either Waterman or Sheaffer dark blue ink, and I was on my way. This is absolutely one of my favorite pens, and if we go by age (68 years old) it would be number one in my lineup. The nib is perfect, not much flex but not a nail either. There's some wetness to the nib, but that could be a function of the ink rather than a flaw in the pen. It's lightweight, and the celluloid has great transluscence (when Ron had taken the pen apart I got to see inside it, and the blue and red stripes are actually opaque). The line is just the width I like, and there's no scratching or skipping. It's just a fabulous pen, and I now have a Parker Duofold in my collection. What was also impressive was watching Ron Zorn work his magic on this pen. Watching any professional at work is always impressive, but watching Ron, who clearly loves what he's doing, was just amazing.